Sorry for the gap between posts, friends. The truth is that I spent so much time eating this past weekend that I didn’t have time to post. And the truth is that I ate so much that I really can’t cram it all into one post. So, today, I’m going to present what I ate between the hours of 1pm and 5pm on Saturday, and on Wednesday, you’ll get to read about what I ate/drank between the hours of 5pm and 7:30pm. And just so you don’t think I’m an appalling glutton, let me offer the disclaimer that most of this consumption was done in the name of research – I had to review a few restaurants for a magazine. And as I learned in school, research legitimises anything. First up was lunch with Kirk and Gi. This Cultured Couple just reeks* of good health, and when they invited us to their favourite raw food restaurant, we couldn’t say no. Rasayana is an organic oasis located next to a dog physiotherapy pool** on a quiet street in Thong Lo. The moment we set foot on the porch, we were enveloped in waves of hippy goodwill. Like wallowing in pure rainforest essence. Whatever that means. 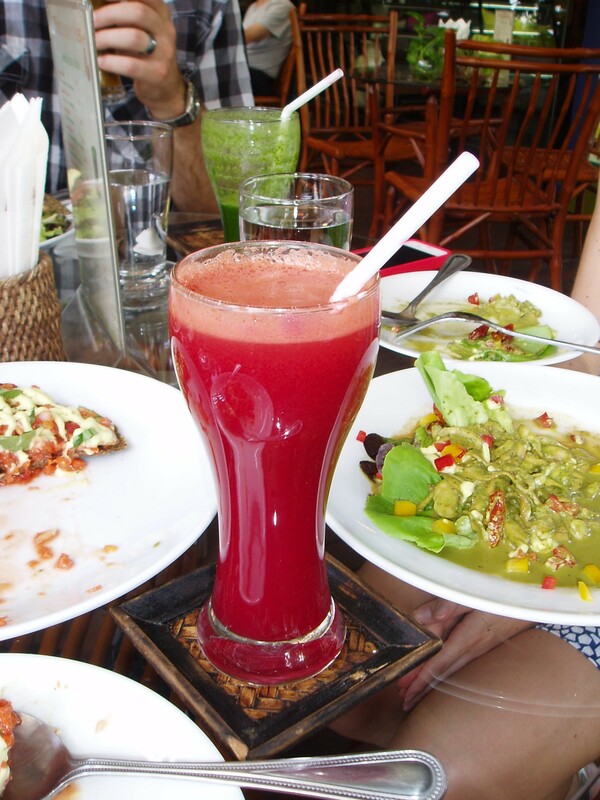 We all started off with fresh-pressed juice. If I was a better food writer, I’d be able to tell you what each contained, but let’s just say that Kirk and Gi’s juices were green, mine was purple, and Todd’s was puce. And they were loaded with health. Because all the food at Rasayana is raw (can’t be heated or cooled beyond certain points), the restaurant has to be really creative in its recipes and ingredients – we were really impressed by its interpretation of popular dishes. We sampled the mushroom burger, the pizza, and the pesto pasta. The “bun” was a sunflower seed crisp. A tomato-carrot filling covered in cashew cream and fresh basil. Zucchini noodles with fresh basil pesto. And going raw doesn’t mean going without dessert. We ordered the key lime pie, the doughnuts, and the carrot cake. Carrot “cake” with strawberry sauce. All of them were tasty, but the lime pie was the clear winner in my books. The meal finished with room temperature water, and warm tea. I could feel pure health radiating out of my pores. But Gi’s pore-radiating was much prettier, so here’s a picture of her. Unfortunately, I then chose to undo all the benefits of raw food by visiting After You, a popular Thong Lo dessert destination. In my defence, I had to review it, but the timing was poor. I scooped up Hanna, a little buddy from my years working at summer camp, and forced her to eat cake while I snapped photos. She ordered the sticky toffee toast, while I had the mocha-toffee cake. EAT IT NOW, HANNA!!! But not before I get a good photo. My cake was good – an appealing slab of chocolate cake with toffee-nut topping, but Hanna’s toast was the winner. I couldn’t keep my fork off her plate. Something about a butter-drenched slab of white bread covered in toffee and ice cream just does it for me. Sorry, buddy. You just don’t measure up to the toast monstrosity. Hanna tried to fend off my fork while simultaneously pretending that she didn’t know the crazy person bumping into waitresses and snapping awkward photos. As the toffee and butter wrestled with the raw food in my gut, I grabbed T-bone, and we headed to the day’s next culinary destination. Coming up on Wednesday: cocktails at Gossip! *See, Mom: I learned how to spell “reek.” You can stop mocking me in the comments section. Foodie Friday: Super local! Super organic! Eating locally/organically is a huge trend in North America right now. It has even hit my home city of Calgary, which is saying something, because A) Our growing season lasts for about 2 weeks and B) many Calgarians consider “redneck” to be the ultimate compliment. However, grow it has, and my mother, the original hippy/granola-girl is no longer alone in her obsession with all things home grown. I think this trend is generally a good thing – nothing wrong with using fewer chemicals and resources. The downside to the “locavore”/organic movement is how darned sanctimonious it often is. * Like, “lips that touch pesticides will never touch mine.” I personally alternate between being a self-righteous organic foodie and wanting to puke a little. These lips are touching doughnuts. It begins just outside our apartment courtyard, where the local welding shop produces tasty rabbit meat (ok, I have no idea if this bunny was destined for a bowl or pet-dom, but I’m guessing the former). Stroll a little farther down the road, and you hit the local khlong (canal), which is essentially the lifeblood chugging through the clogged artery of this neighbourhood. This is where most of the “sea”food in the neighbourhood is caught. Continue walking along the khlong pathway, and you’ll come to an organic pork farm. I couldn’t get a good picture of the squealing piglets without blatantly trespassing, but they looked like they were having a grand time rummaging through piles of scraps and garbage. There are also a variety of good-natured ganders pit-pat-waddle-patting around in the muck. Is it just me, or are ducks just so good natured? Walk through the market and turn the corner, and you’ll come to the organic chicken farm. This is a critical operation, because deep-fried clucker is the cornerstone of Todd’s teacher-buddies’ diet. And there you have the Thai version of local’n’organic meat. Knowing where my food comes from fills me with a complex mixture of emotions, but “sanctimonious” and “hungry” are not among them. * No, ma. Not you.